Haitians have immigrated to North America from their impoverished Caribbean island nation in large numbers in search of a better life. Political persecution and strife, widespread poverty, corruption, tropical storms, and the devastating earthquake of 2010 have all contributed to the exodus to North America. Haitian immigrants attempting to reach the shores of Florida on boats are routinely intercepted by the United States Coast Guard and often repatriated. Haitians bring many of their cultural practices and ideologies into their communities. Many foreign-born Haitians go into the business sector, often setting up their own businesses, such as barbershops and family owned restaurants (predominately of Haitian cuisine). Haitian Americans have a visible cultural presence in Little Haiti, Miami, and nearby communities such as Golden Glades and North Miami. Other significant Haitian-American communities are found in several neighborhoods of New York City. 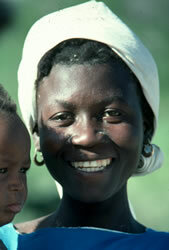 Most modern Haitians are descendants of former black African slaves, including multiracial Mulattoes. They communicate in Haitian Creole and are either familiar with, or learn English, while most of their descendants speak English fluently. Religiously, most Haitian Americans, like their counterparts in Haiti, are Roman Catholics, although there is often a significant mixture of Haitian Catholicism with Voodoo. Protestant Christians also have a presence among Haitians. Pray for Haitian Christians to live lives that are above reproach and to be bold in their testimonies. Pray for Haitian Christians to be pure in their faith and not allow the mixture of traditional voodoo practices. Pray for Haitian Churches to grow and thrive in the USA. Pray for Haitian believers and Churches to catch a vision for reaching not only their people, but the Unreached People Groups around them.